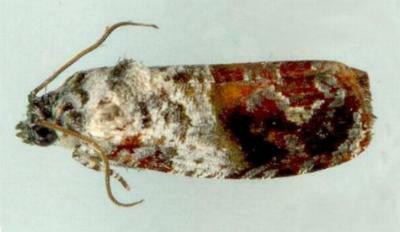 The adult moth has forewings that are basically pale grey in the basal half, and dark brown in the marginal half. The forewings are overlaid with a complex grey pattern. The hindwings are plain pale brown. The wingspan is about 1.7 cms. CSIRO Publishing, 2006, pp. 128-134. Volume 36, Part 2 (1911), p. 270, No. 385.